Father Jeremy is originally from Saint Cloud, MN. 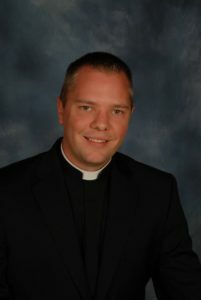 Ordained in 2012, he became pastor of the Church of Saint Olaf, the Church of Saint Gall, and the Church of Saint Charles in the Summer of 2016. Father Jeremy is a fan of college and professional football, professional hockey, college basketball, and major league baseball. In theology, Father Jeremy is especially interesting in historical theology – the study of how we came to understand the Word of God and when we learned what we now know about Almighty God.